“Being: Liverpool” is a documentary for Fox Sports done by Emmy Award winning producer Scott Boggin. The documentary goes behind the scenes at Liverpool F.C. with narration done by Golden Globe winner Clive Owen (who also happens to be a Liverpool supporter). The 6-part documentary follows Liverpool beginning at the end of last season, through their summer North American tour, and into the beginning parts of the current season. The debut airing of the Being Liverpool will be shown on U.S. television on Sunday, September 16 on FOX TV either before the 3pm EST NFL football game or after the 4:30 EST NFL game. Be sure to check your local listings for show times. The first episode is titled “Silver Shovel.” If you are unable to catch the first episode you can always catch repeats on Fox Soccer Channel along with several other channels throughout the week (National Geographic Channel, Fox Sports Network, MundoFOX and FUEL TV. Check the below table for show times. Repeats will again be showing on National Geographic Channel, Fox Sports Network, MundoFOX and FUEL TV. My personal opinion on the documentary: While I am far from a Liverpool supporter, I am planning to watch the documentary. I hope that the air time will bring other Americans into the wonderful world of the English Premier League. I also think that the exclusive access to a Premier League club will be very interesting to watch. I really hope that they show the banter between players throughout their day (particularly match day) and would love to see the interactions with the players and manager. It would great if they could include some of the behind the scenes with support staff and, even better, the owners. ← Premier League Perspectives: Should there be higher fines for a red card? 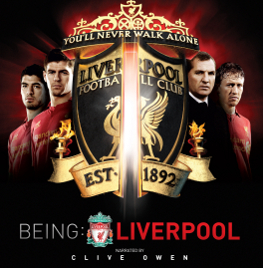 Home » TV Schedule » Premier League TV: When will “Being Liverpool” Documentary Be Airing On TV?